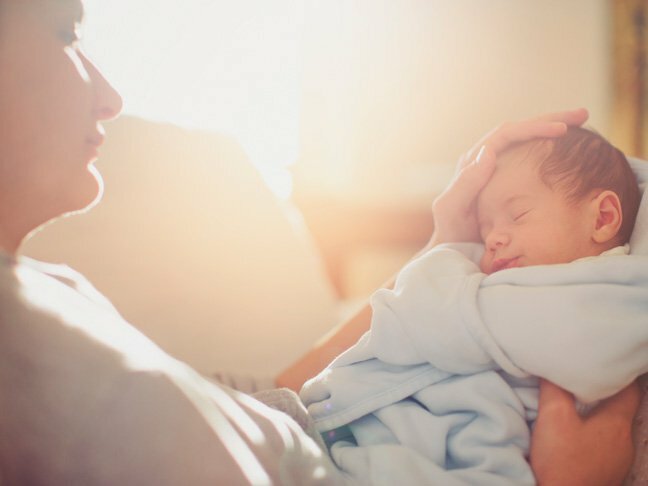 All parents are anxious about newborn breathing; it’s not just first-time parents who get up in the middle of the night to hover over their sleeping baby and watch them breathe. How do you know when your baby’s breathing is normal? When do you need to be concerned? Read on for everything you need to know about newborn breathing patterns. Are irregular newborn breathing patterns normal? Yes. Irregular breathing is usually nothing to worry about. Babies in deep sleep will often take some rapid breaths, not breathe at all for about 10 seconds, and then breathe again. This pattern of periodic breathing is normal, and about 78 percent of all newborns do it, especially in the first two weeks. These periods of holding in breath for up to 10 seconds, also known as sleep apnea, will gradually diminish over the child’s first six months of life. Is it normal for a baby to breathe fast? Yes, it’s normal for newborns to take about 30 to 60 breaths per minute with 40 being the average. Rapid respiration occurs because newborns are tiny, and the smaller a creature is, the quicker it breathes to fill its small lungs with enough air and oxygen. When babies sleep, their respiration might slow to 20-40 breaths per minute. When should I worry that my baby is breathing too quickly? If your baby exceeds 60 breaths per minute, it might indicate a problem, but the circumstances are important. Babies normally breathe fast if they’re hot or crying, but if they keep going even after they’ve cooled off and calmed down, it might be a problem. Watch your baby’s face and chest; if your baby’s nostrils are flaring or your baby’s chest is getting pulled in below the breastbone or above the collarbones at every breath, your baby’s breathing might be obstructed, and your child might be fighting for air. In that case, seek immediate medical help. Should I worry about noisy breathing? It’s important to listen to what kind of noise your baby is making. If you hear a whistling sound from your baby’s nose, it’s usually nothing more than a sign you need to grab the big blue bulb sucker and remove dried mucus. More serious sounds include deep or barking coughs or wheezing or labored breathing. If you’re worried, it’s a good idea to keep a record of times and types of sounds, even snores, and then consult with your child’s pediatrician for further advice. It’s natural to be concerned, but new parents don’t always have to be. It might help to remember that babies are brand-new to the whole breathing concept, so their breathing will normalize over time. For the most common questions about newborns, from poop problems to eating habits, answered by pediatricians click here. My Kindergarten Boy Is Not Even Close To Being Dry At NightDoes Natural Hand Sanitizer Really Help Prevent Colds & Flu?